W-1188: Through the development, evaluation, and improvement of instruments and analytical methods that measure and monitor flow and transport processes, this project has reduced the detrimental impact of human activities on valuable resources such as plants, soil, water, and air in the United States. Issue: Water, soil, and air are interconnected resources that are finite and need to be carefully managed. Thus, an in-depth understanding of the biotic and abiotic processes and transformations that affect these resource interfaces is critically important for choosing appropriate land-management activities. We can monitor, change, and enhance our stewardship of these finite resources if we know how, when, and why human activities that impact them are chosen. Activities that affect these resources and their interfaces are diverse and can include waste storage and containment; management of nutrients, plant residue, salinity, and pesticides in agricultural and horticultural systems; mitigation of climate change impacts; mitigation of noxious weed impacts on surface and subsurface water resources; optimizing of storage of greenhouse gases in soil and geologic formations; and minimizing of societal costs of catastrophic events like fire, drought, and flooding through improved predictions. Researchers have created artificial systems in the laboratory to allow small-scale measurements of the transport and transformation properties of water, energy, compounds, and gas (single and multiple) under controlled conditions. Researchers have taken measurement devices and sensors they have developed, calibrated, and refined in the laboratory and then evaluated and improved them for field monitoring applications. Applications of new mathematical and statistical techniques have improved modeling approaches and have evolved our ability to efficiently and quantitatively measure important parameters at the laboratory, field, and catchment (drainage basin) scales. New collaborative and shared research instrumentation facilities have been created for use by all participating scientists, reducing duplication and greatly enhancing the quality of field and laboratory analytical capacities. State and federal resource management agencies have developed best management practices and policies to improve resource stewardship, minimize environmental degradation, and avoid catastrophic events. Scientific capacity has been increased through collaboration and training with graduate students; joint creation of lecture and laboratory manuals and software; engagement with non-land-grant institutions, USDA Agricultural Research Service, and international faculty exchanges and training programs; and, securing/leveraging of funding from the U.S. Department of Energy, USDA, USEPA, the National Science Foundation, and state(s) competitive awards. 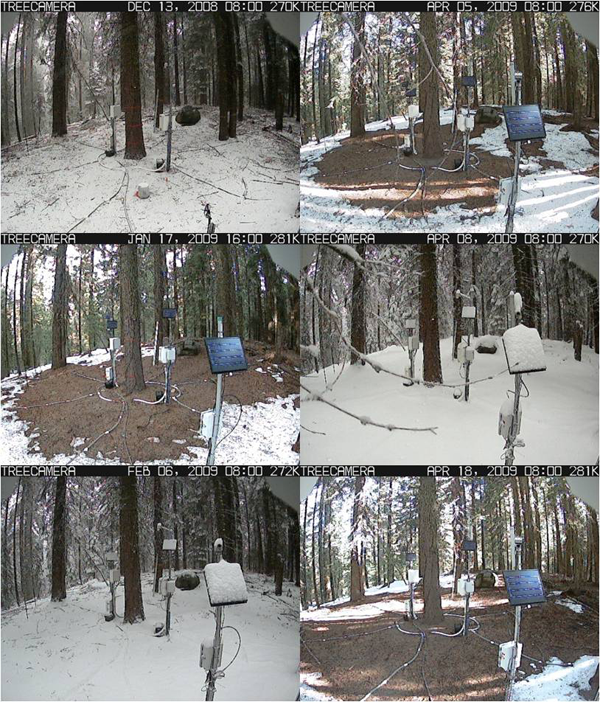 The dynamics of snow cover. Agriculture production is influenced by water, soil type, climate, tillage, crops, temperature, application of nutrients and pesticides, chance, and management practices. The inherent nature of agricultural land use—whether it is for dryland and irrigated crop production, nursery and greenhouse practices, turf, forestry, or livestock grazing—is that it has the potential to impact the environment. The research activities of this project have improved the efficiency of irrigation systems (California), managed salinity and irrigation return flow on site (California, Kansas), decreased nutrient loss through leaching or runoff (Kentucky, North Dakota, Oklahoma, Oregon, Minnesota), and developed methods and equipment to enhance measurements and monitoring (Iowa, all). Historical methods of mineral extraction and energy development throughout the United States, and particularly in the West (Arizona, Montana, Nevada, Utah, Wyoming), have left large expanses of landscapes drastically disturbed and subject to ongoing environmental problems. 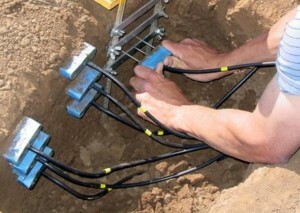 Mitigating these problems involves a variety of techniques, all of which are designed to keep the problem materials on site. Monitoring by project researchers of above-ground movement of these materials that occurs through erosion processes and below-ground transport that occurs through water or gas processes has demonstrated good mitigation practices. Contamination from mine tailings has been stabilized through the use of adapted plants and their positive synergies with microbial populations. These create a “biological cap” that prevents movement off site caused by wind erosion and minimizes water transport of these materials..
Human activities create by-products that, if not properly reused, recycled, or stored, have the potential to cause extreme environmental and health damage. An example of remediation is the injection of gases and compounds into nuclear waste storage sites, which has helped to protect water resources. The injection of the gases and compounds causes a chemical and physical barrier so that transport/movement of harmful by-products is severely limited. In addition, based upon monitoring techniques and devices from this research (Arizona, California, Washington), municipal landfill sites have been modified to decrease the type and amount of off-site transport of harmful materials, including hazardous household products, pathogens, pharmaceuticals, and hormones. Water quality and quantity are increasingly prominent issues creating conflict and challenges. These challenges require thoughtful policy decisions that are based on quantitative monitoring of resources and the use of appropriate and accurate scaling technologies that integrate a site (plant, soil, water), multiple sites, a catchment, and larger geographies with differing water uses. Situations in which these data could be applied include state and federal water and land resource agencies and municipalities (snow pack, surface waters) (Arizona, California, Minnesota, Nevada, New Mexico), water treatment and reuse facilities (North Dakota), drought prediction (California), fire risk management (many), sustainability and conservation initiatives (Colorado, Nebraska, Oklahoma, Texas, Wyoming), climate change (all), and surface and ground water use and protection practices (all). To improve our understanding of vadose zone (zone extending from the top of the ground surface to the water table) properties and processes and how they interact with other environmental and biogeochemical processes across time, space, and scales. To develop, evaluate, and improve instruments and analytical methods that measure mass and energy transport and environmental transformation in the soil and vadose zone at different scales. To apply scale-appropriate methodologies to enhance the management of vadose zone resources that benefit agricultural systems, natural resources, and environmental sustainability.